In keeping with the 'do as much as we can ourselves' approach, and in the wake of the horror story that was our experience with a lime plasterer, we decided to go on a lime plastering course a couple of months ago (the end of June to be more precise). There are a few lime product suppliers in the UK, of which we've used three so far for our various house-related purchases: Lime Green, Ty-Mawr and, randomly, Travis Perkins. Lime Green and Ty-Mawr make their own products as well as selling others and we've found both of them really helpful. In addition to making and selling products, Ty-Mawr also offer courses on Lime and Lime Plastering. So, after umming and ahhing for a bit, we signed up. 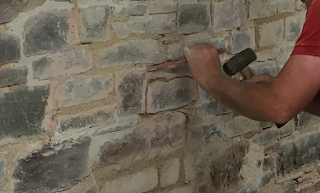 The course comprised of two days - the first day focusing on an introduction to general lime in building, and the second focusing more on lime plastering. The setting is Ty-Mawr HQ in Brecon, Wales - a really gorgeous location with a great set of old buildings that have been treated as product experiments, while also performing normal home/work functions, and a vegetable garden that puts our couple of raised beds to shame. The co-founder of Ty-Mawr, Nigel, oversaw most of the course, with a couple of experts (Scott, Matthew and Sam) in the plastering and lime fields taking over for the practical/hands-on parts. You also get a book written by the founders of Ty-Mawr to take away and refer to when you've forgotten the inordinate amount of information that's imparted! Well-graded sand is sand with a good mix of grain sizes - some at the fine end of the scale, some at the course end of the scale, but mostly 'middling' sizes - a good bell-curve distribution of grain size. 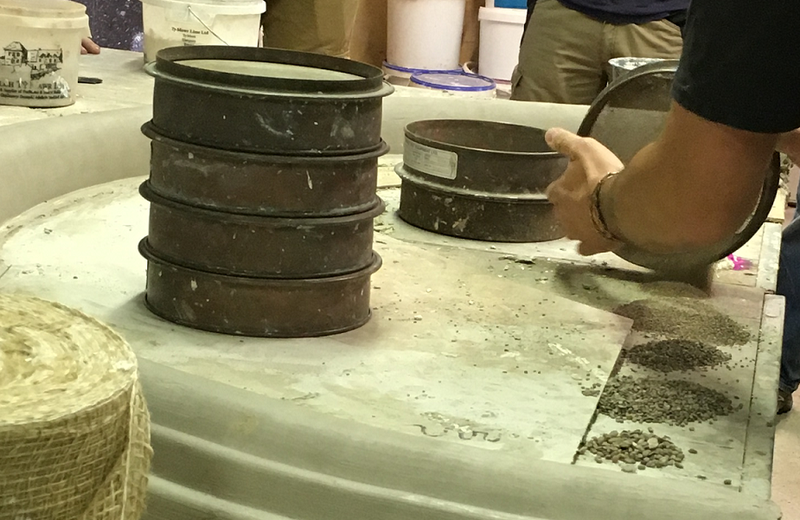 Using well-graded sand gives a good void ratio, so if you add water it will take a third of the volume of water in the same container that is already filled with sand. Lime changes its chemical composition as it goes through various treatments, known as the lime cycle. It is first dug from the ground, then crushed and burnt - at which point it becomes quicklime. 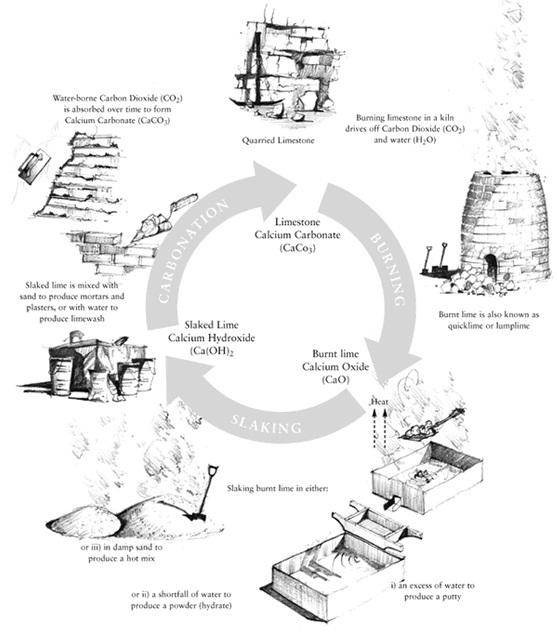 This is then 'slaked' - where water is added, or extracted, to produce either lime putty (also known as fat or hydraulic lime), or the more-familiar lime in powder 'hydrate' form (non-hydraulic lime) that we buy to mix with sand to make mortar etc. When these products are allowed to set, carbon is reabsorbed into the plaster/limewash/etc, and the final stage returns to its original CaCO3 chemical composition. Lime sets by absorbing CO2 from the air. If it dries too quickly, it won't set. Carbonisation occurs at around 2mm a month. Dry lime is not the same as set! Lime putty is also referred to as: non-hydraulic lime (NHL), and fat lime. It is quicklime (lime that has been burnt and crushed) and water. If you cover the surface of lime putty with water it will keep indefinitely. Lime putty is fixatropic, so the more you 'work' it (knead it, mix it, etc) the more 'liquid' it becomes. When mixing powdered lime, mix dry sand and lime first, and add water to the mix afterwards - this will prevent the lime 'balling' in the mix. Lime is less dense than cement, so will rise up at the back of a cement mixer - pull it back down into the mix to ensure it is mixed evenly - add the water after this. Give this sufficient mix time to ensure that it is wet through, without excessive water (around 15 minutes). You cannot over mix it! You can leave the mix overnight and mix it again the next day. Different makes of lime use different sources: St Astier (from France) tends to be nice and fatty and a finer grade than Singleton Birch (from Portugal). There is also Hanson (also from France). Use a plugging chisel to remove pointing. Rake out twice the width of the joint when removing pointing. Thoroughly wet the wall down first and leave for around 20 minutes before starting. Brush the wall to knock off any loose bits of mortar etc. Pin out any large holes (throw a lump of mortar in, then wedge in a small stone). Mortar consistency should be 'wet sandcastle' texture. Using a pointing trowel, push the mortar into the joints, leaving it slightly proud of the surface. If you use a pointing bar, moisten the bar with a sponge or damp cloth. Tap the pointing with a stiff brush (this is calling 'knocking back'), to ensure the mortar is in the gap properly. Shade your pointing from hot sun, or cover it with a damp blanket or hessian. The sand to lime ratio for both mortar and plastering is the same, but plastering is much wetter. Hair is added to the base coat mix, which ties the mix together and adds flexible strength. The hair is usually either goat, horse, cattle, or synthetic, and is around one-inch long. Fibrelime is a single-coat plaster that Ty-Mawr make for Singleton Birch. Aggregate size should be a maximum of one-third of the coat thickness, eg 9mm depth, 3mm maximum aggregate size. This stops 'scrapes', where aggregate drags between the surface and the tool that is applying it. You should use alkaline resistant mesh, etc. Don't use galvanised nails, as the galvanised coating will (slowly) react with the lime. The plaster bonds to the surface either by suction, or by physical bond. Bagging refers to rendering or plastering over the texture of stone/brick, so that the texture remains visible. Lime plaster will adhere to concrete blocks, and you can also use material to tie lime plaster to plaster board, if you need/want to carry the look and feel through into a modern area. If the surface you are plastering doesn't absorb water, don't wet it first! If you struggle to get the plaster to bond to your surface, you can apply a Splatter/Dashing/Hurling coat - where you literally throw a rich 2:1 mix at the wall a day or two before you start to plaster normally. This gives suction, which allows the plaster to key. Plastering is usually done in a three-coat process (rendering is usually just two). 1. The Scratch coat - this is the only coat with hair in, and is around 1cm thick. This should be scored in a diamond pattern (a special scratching tool can be used, or alternatively the corner of a lath). This then gives good grip for the next coat. This mix should be a 2:1 or 2.5:1 ratio of sand and lime, with hair added. The amount of hair to add is a bit nominal - throw in a handful to a mix and look to see that it is evenly distributed throughout the mix, with only a few mm between each hair. 2. The 'Devil' Float coat - this is applied to be around 1 cm thick, a few hours after the Scratch coat, using a straight edge to line it up, and it should then be rubbed over with a plastic float to 'consolidate' it. The mix for this coat is 3:1 sand and lime, with no hair to be added. 3. The Finish/Finishing coat - this is applied to be around 3-4mm thick. It should be done in two thin coats, when you can leave 'finger shadows' in the the first coat, apply the second. The mix is 3 parts silver sand:1 part lime putty. It needs to be mixed with a paddle mixer, so is usually bought pre-mixed. You can then finish off by rubbing the plaster with a sponge float in circular motions (this is optional! ), then brush water on if necessary and smooth with your trowel edge. You can also rub the plaster with a sponge to give a slightly sandier texture, which is good for blending with other plaster, and also good for removing trowel marks when you're a beginner! The richer you make a mix, the more it will shrink. One of the exceptionally knowledgeable people running the course (Scott) was wearing a T-shirt from 'Jones and Fraser Traditional Building' - worth noting for future reference! 1. Choose the right type and strength of lime. 2. Choose an appropriate sand/aggregate. 3. Do not add cement. 4. Mix plasters thoroughly and do not add too much water. 5. Do not remove old lime plasters/renders unnecessarily. 6. Thoroughly prepare the surface. 7. Damp down between coats to control suction. 8. Backing coats must have 'gone off' before applying the next coat. 9. Do not allow it to dry too quickly. 10. Use breathable paint to finish it. This is water from the top of lime putty, or lime wash. It reacts to tan in in oak and darkens it slightly, giving a nice, slightly aged, finish. When fixing laths, you should leave 3-4mm between the ends, to allow for swelling. Hemp plaster is lime putty, hemp, and water. The mix ratio is three parts hemp to one part lime putty, plus water. This mix needs to be mixed in a paddle mixer, therefore it is usually bought pre-mixed. 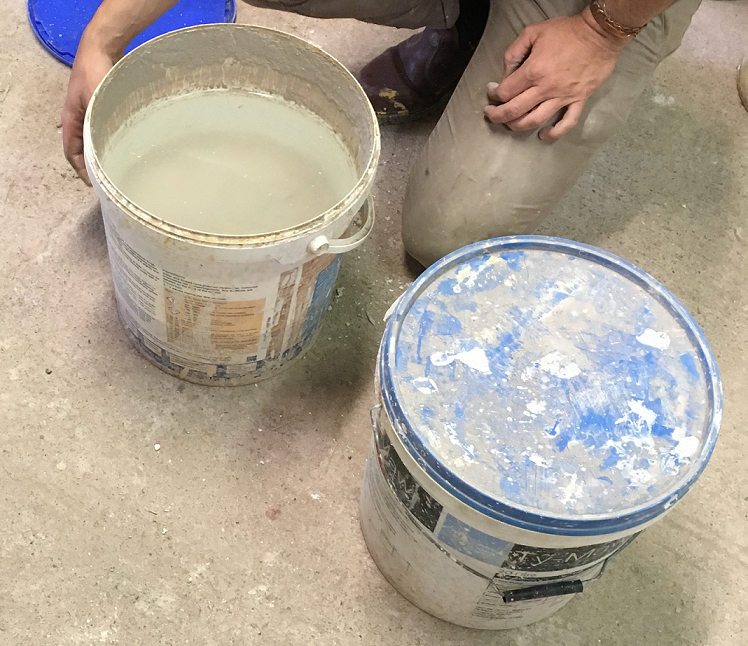 Hemp plaster is much lighter in weight than lime or gypsum plaster, and is therefore favoured by the trade as it's use leads to less long-term injuries! Hemp plaster is also easier to apply than lime. It holds moisture more than lime, however, so should be avoided in potentially damp places. Hemp plaster will keep indefinitely if covered with water/covered overnight with plastic. Hempcrete is a good wall insulator and a good sound insulator. You can use Plaster of Paris as filler! You can also buy Casein filler, or Ty-Mawr's own general purpose filler. Limewash and clay paint are both vapour permeable (and plant-based/mineral-based). Chalk-based paints are usually Latex-bound, so not vapour permeable. Farrow & Ball and Little Green standard paints are both not vapour permeable. Distemper is vapour permeable and also water soluble, which makes it difficult to re-cover. Casein paint is vapour permeable. It comes in powder form to which water is added. Silicate/mineral paint is vapour permeable and water repellent (usually recommended for outdoor use, as it is very expensive - for internal use it is generally only considered really worth it for buildings such as churches etc, where they are only heated once a week). Lime wash is lime putty, water and pigment. The ratio is two or three parts water to one part putty, mixed until the consistency is that of single cream/a batter mix. It will separate when stored, so will need mixing up on arrival. To a 20 litre mix of water and lime putty, add between one and one-and-a-half kilos of pigment. Lime wash must go onto a porous surface in order to bond to the surface. Where the surface is not fully porous (for example has been fillered), you can add casein, a natural porous glue, to help it bond. Add half a kilo of casein (500g) to 20 litres limewash. 20L of limewash will give around 60 square meters of coverage. Limewash will 'heal' small cracks in lime plaster. Wet down the surface to be painted before you start. Apply one coat every 24 hours or so. Apply the limewash with a 'wet edge', so don't cut in first etc, instead start from one point and work away from it, as overlaps will give a different shade. Constant brushing on the same area will burnish the limewash, giving a nice, slightly glossy, finish. Limewash goes on fairly transparently, and the pigment comes out as it starts to set. Mist the limewash for two to three days after painting. Lithomex is a stone repair material - a mortar based on Natural Hydraulic Lime, designed for the repair of masonry, brick and stone. There exists something called Prompt, which is a natural cement. Hydraulic Lime has water entrainers added to it to create breathability. R50 (HL) will adhere to marine ply. R100 (HL) will stick to painted surfaces. Venetian plaster can be used in a shower (similar to Morrocan plaster). A 'breathable PVA' equivalent is Casein.